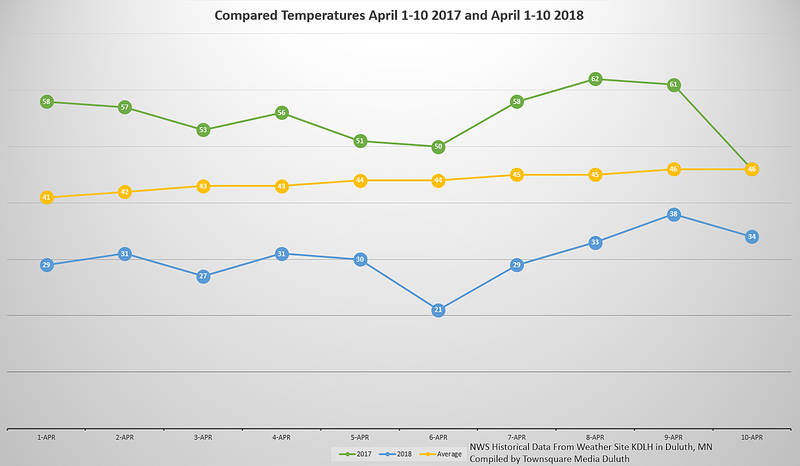 How Much Colder Has April 2018 Been Than April 2017 in Duluth? It's no secret that winter weather has been hanging around for what seems like forever. December-like temperatures and a string of snow events through Minnesota and Wisconsin seem very much out of the norm, and they are. How different is this April compared to last year, though? You might want to sit down for this. First, the disclaimers. These figures are from the Duluth International Airport, where historical weather data for the Twin Ports is officially recorded. That said, what you've seen where you actually live may be different than what was officially recorded at the airport on top the hill. Second, on the day of this publication (Wednesday, April 11), the temperature is actually in line with normal temperatures for this time of year for the first time this month. In the first 10 days of April 2018, we've seen high temperatures fall between 21 and 38 degrees, with an average temperature over that span of time of 30.3 degrees. Brrr. In the same first 10 days of April 2017, high temperatures ranged from 46 to 61 degrees with an average through that span in 2017 of 55.2 degrees. That's a temperature difference of 24.9 degrees colder on average this year compared to last year. Depressing, right? The "good news" is that after this storm we're expecting to hit somewhere in Minnesota/Wisconsin Friday and Saturday, we should see a warmup of sorts with high temperatures in the 40s all of next week and a chance to maybe see 50 by the end of next week. Progress? It is worth noting that much of the region saw one of the warmest Aprils on record in 2017, and April 2018 is one of the coldest on record so far. Those extremes just make it seem all that much worse. On average, we should be seeing temperatures in the mid 40s, which is where we're headed next week according to the latest forecast data. Hang in there. We'll see spring-like weather. Eventually.